Greetings Friends and Bloggers. 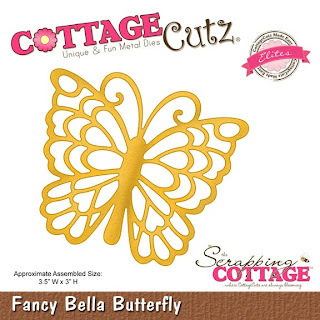 Welcome to my CottageCutz Fancy Bella Butterfly project. Isn't this color awesome. It is the special edition Tim Holts Peacock Feathers distress ink. It's so pretty-I just love it. 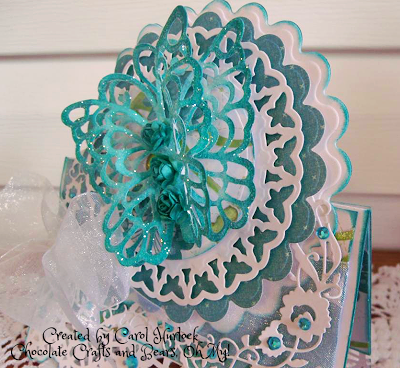 What I have for you today is called a tent topper card. 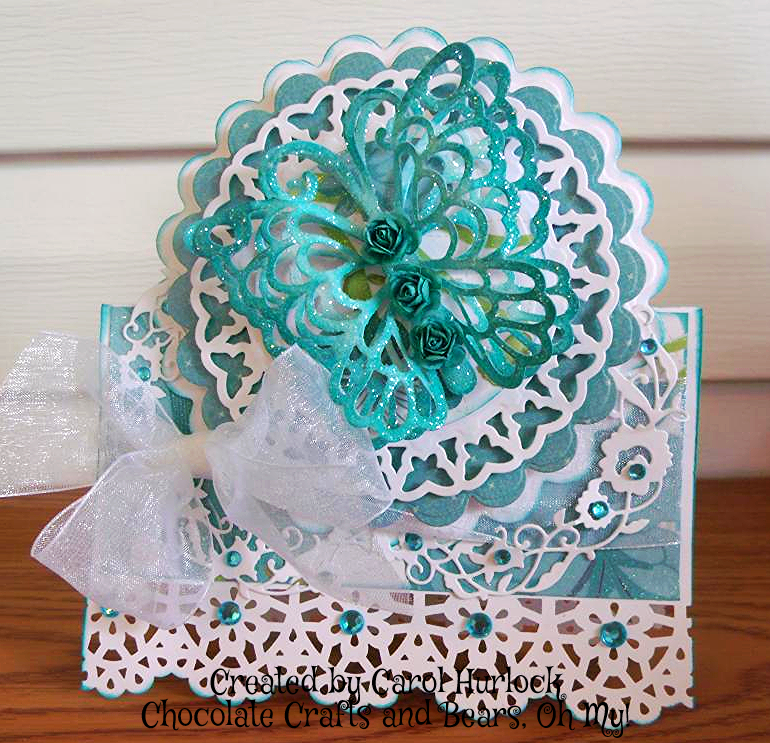 To create this gorgeous butterfly die cut two of the Fancy Bella Butterfly. Distress ink with the Peacock Feathers distress ink making sure to ink the edges darker on the outer edges of the die and pull the color towards the center so it is lighter. Paint both butterfly pieces with glitter glue and sprinkle Martha Stewart plain white glitter over the top and let it dry. Once it has dried, use pop dots to attach the two butterfly pieces together and shape the wings. The glittered pieces help the wings to hold their shape. Glue some tiny prima roses down the middle for accent. 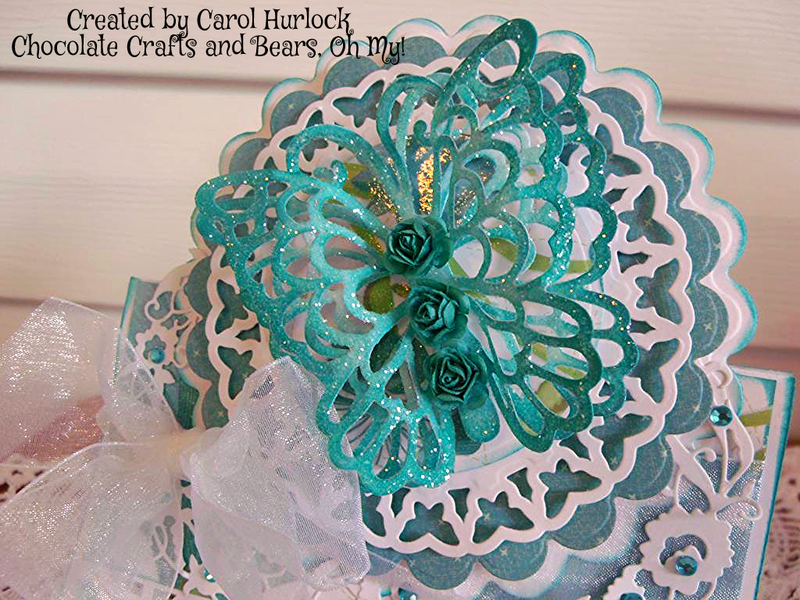 For the focal point, attach your butterfly to a Spellbinders Nested Circle on top of the Spellbinders Nested Butterfly Circle, then two more layers of scalloped circles. 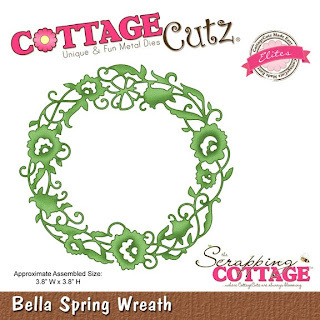 The largest nested circle is from the Spellbinders Grand Scalloped Circle die. Absolutely BEAUTIFUL card Carol!!! I LOVE the color you use, and the dies! 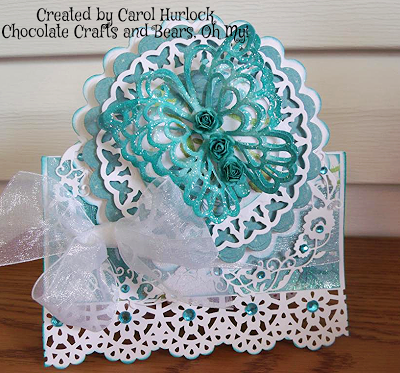 beautiful butterfly and love all the different die's used on your card. Also LOVING the topper!!! it's a very beautiful card Carol. Carol, your tent topper is gorgeous. I love all the turquoise and that gorgeous butterfly. What a beautiful bottom border, too. Gorgeous butterfly!!! Love the mix of dies you used too. Beautifully crafted! I love the gorgeous color & all that lace is just perfect to make this an awesome topper. Wow! That Butterfly is huge, but gorgeous, and colors just awesome. Lovely fold too. 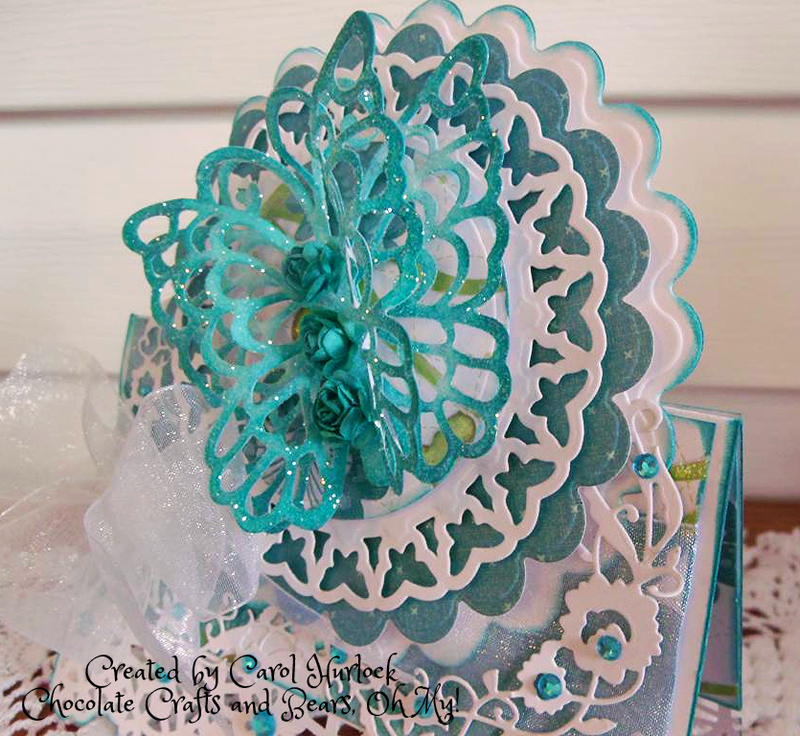 Carol - it would be harder to make a card any prettier than this (actually you could but the rest of us would struggle). 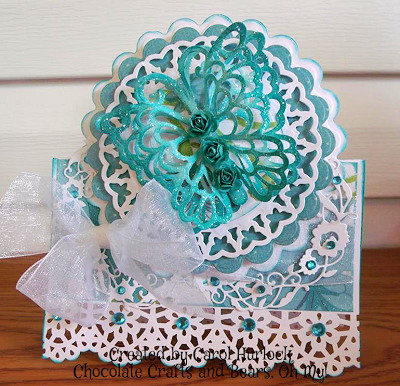 I love this multi-layered, sparkly, and very beautiful card. Lovely work! Hugz!!! !